Feelings: Steven C wanted to check out Peter Pan in Greenpoint. I heard on some local news that it is a good place for dessert, so we both had to see what the hype was all about. After all, if it's been here for years, it must be good! As soon as we went into this Polish patisserie, it reminded me of American diner themed bakery in Japan. It is straight out of "American Graffiti," which Japanese people have the fixation over, but I had no idea that this was a global phenomenon. I would love to see if every country has an Americana themed bakery. The shop was full of the locals, some speaking in Polish. Some seemed to be deep in thought and some just sat and enjoyed each other's company while dunking their fluffy non-Dunkin Donuts and sipping their coffee. This is a perfect place for people watching or character studies for your next screenplay or sketchbook, for there are quite a lot of interesting people in various stages of their lives here. LA native Steven C has never tried New York's cold beverage of choice, egg cream before, so I insisted that he gets one. He analyzed the vanilla egg cream thoroughly and said it tasted like cream soda. He also thought his cruller was tasty and affordable. RB and I ordered blueberry and cranberry muffins, which were light and fluffy and tasted like what a classic muffin should taste like. Most muffins taste like cupcakes sans icing, so this was a nice surprise. 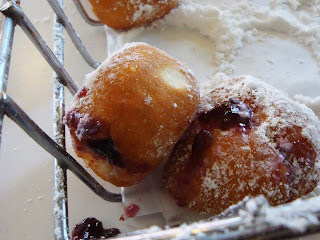 I can't wait to go back and try their other pastries and donuts. I understand now why Peter Pan has been around for years, maintaining their good flavor and atmosphere. If I lived in Greenpoint, this would be my local staple. 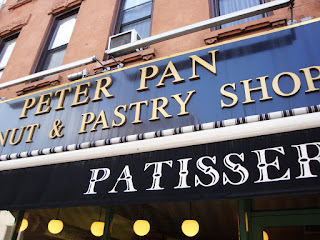 Awww...man, I was just in Greenpoint today and totally forgot about Peter Pan. I did come across a lot of Polish bakeries. Have you tried any of them? Never tried polish bakeries! just walked by them.. Have you been to Champs Family Bakery? They make all vegan baked goods!